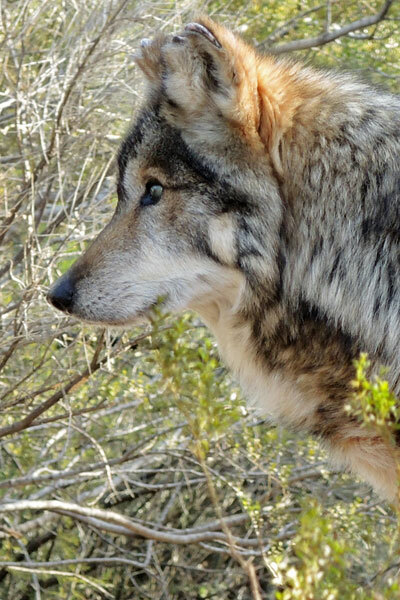 Mexican gray wolf M889, Nico (short for Unico, Spanish for unique), was born in 2004. He is one of the three brothers that came to Southwest Wildlife from the Brookfield Zoo. Nico only has 3 legs. His left front leg was amputated at the Brookfield Zoo, but he gets around just fine. These days, Nico doesn’t see or hear well, so he’s been moved to a quiet, off-exhibit area where he’s currently living alone. He’s comfortable with his new, shady enclosure and is able to relax without worrying about activity happening around him. The comfy day bed he dug himself and mealtime are two of his favorite things.